AU Optronics announced several new display products, including some new OLED panels - a 12.3" Full-HD AMOLED display, a foldable AMOLED panel and OLED displays for smart watches and VR headsets. The foldable panel features a thickness of only 0.1 mm and can be repeatedly folded over 200,000 times on a radius of 4 mm. This is an improvement of AUO's previous bendable panel (shown above) that was 0.2 mm thick. AUO said that the company aims to launch a 5.5" Full-HD AMOLED panel for the VR market (which probably means it will have a faster response time). The most interesting news from AUO is that it will begin to produce LCD panels in its Gen-6 LTPS line in Kunshan, China, in Q3 2016. The fab's initial capacity will be 25,000 substrates - this is only the initial capacity and at full rate it will reach 60,000 monthly substrates. 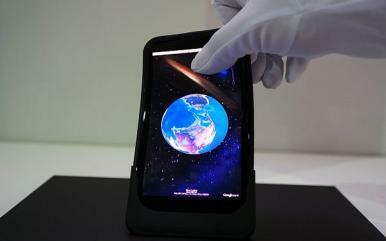 AUO said that the rest of the capacity may be actually used to produce AMOLED panels instead of LCD ones - and this will be decided if demand for AMOLED panel is large enough and supply will be short. According to some reports, AUO is actually discussing a collaboration with Apple that may fund this AMOLED project. AUO will require regulatory approval from the Taiwan government though because AMOLED is an advanced technology and they are not supposed to transfer this technology to plants outside of Taiwan. AUO is currently producing 4.3", 5" and 5.5" AMOLED displays for mobile phones and also 1.4" round AMOLEDs for the wearable market. Please contact us if you need help with finding a supplier for AUO's AMOLED displays.